Beauty is in the eye of the beholder. Sadly, in the world of dog breeding, some dogs are bred simply because they are thought to be beautiful — by breeders and buyers alike. So it is with the double merle. Merle refers to a color pattern, not a color in and of itself. 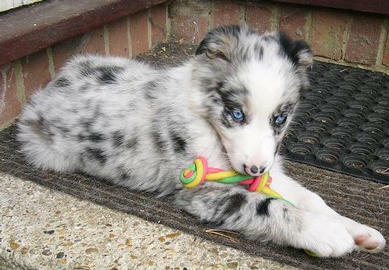 Merle dogs come in many colors, the most common of which is blue merle, found most often in Australian Shepherds. Blue merles are, in fact, black dogs with the black broken up into irregular patches by lighter shades of gray. In some “circles”, the lighter, the better; the whiter, the prettier. This has led to the irresponsible breeding of male and female merles in the hope of producing as many light merles as possible. The unintentional result: the double merle. Whether they are called double merles, lethal whites or homozygous merles, these dogs are born carrying the MM gene, leaving them unable to produce pigment. Some of the most popular breeds affected by this so-called MM genotype include Australian Shepherds, Border Collies, Cardigan Welsh Corgis, Catahoula Leopard Dogs, Collies (Rough and Smooth), Dachshunds (known as dapples), Great Danes, Old English Sheepdogs and Shetland Sheepdogs. The unethical practice of breeding double merles is generally condemned worldwide, not only because so many are considered defective and put down at birth by their breeders, but because of the health problems that plague them, namely, partial or complete deafness and blindness. Numerous myths have arisen concerning double merles. If deaf, blind or both, they are reputed to be aggressive, unpredictable, untrainable, prone to other health issues, even a shorter life span. According to studies, however, none of this is true. Double merles, despite their deficiencies, are generally quite healthy dogs capable of living long, otherwise normal lives. And they are no more aggressive, unpredictable or untrainable than hearing and sighted dogs. To dispel another myth, there are homes more than eager to adopt, train and love such special needs dogs. Experts stress the importance of not viewing them as “handicapped.” While they do have certain limitations, they themselves are not aware of this, and can be as active and affectionate, playful and pleasurable as any other dogs. Families adopting double merles first receive their own training, and what they learn is promptly passed on to their dogs. Deaf or hard-of-hearing dogs are trained through the use of sign language or hand signals. Lights and vibrations can also be used. Deaf/blind double merles are trained by touch signals and scent cues placed throughout the home. Blind double merles are trained through the use of both sound and scent cues. All sharp edges at eye level are either bubble-wrapped or cushioned by towels for added protection. All stairways are baby-gated, and either a textured mat or a scent placed before each one to alert the dog to the gates’ proximity. And, so contrary to popular misconception, double merles can and DO lead happy, balanced and productive lives. In fact, to the delight of their proud and loving owners, double merles excel in many areas and numerous arenas. They often compete at the highest levels in agility, win ribbons at kennel club showings, participate in K9 nosework, and become therapy dogs – to name but a few. I read with interest, as I am owned by a merel BC. I searched and researched his background for working ability. I was not looking for a merel but was rather chosen by him when he came to sit quietly under my chair away from the litter mates. Merel in my mind is a recessive gene like red factor in Hostien cows. It makes no difference to their milk production but if bred for the red factor considerably narrows the genetic base to choose from. Years ago I found one of my BC was working in Alaska as a lead sled dog. I was told he was strong enough to stay in front but had the willingness to take direction and lead. I was also told his blue eye let in more light in very long dark runs … a type of night vision. His handicaps of size and vision were his assets. I do admit this present BC merel is a strong willed dog not easily directed unless with an equally experienced strong handler, but typical of BC if he does it once it’s a habit. Double merle breeding is to be condemned, and while it is of course imperative to provide the double merle victims with a happy life, being partially or fully blind and deaf is most assuredly a handicap — and one that was entirely avoidable by responsible human beings. Love the dogs, but don’t be gentle with the people responsible.